I just learned that William Crolley passed away june 6 last year (2018). I first heard mention of Crolley back in 2013.He was not on the list I had originally been supplied of the people who played in Dave Arneson's games, but that list was never a complete list. It has taken me a while to get around to people like Crolley and it is a shame that I never got to talk to him or write to him. "Crolley, William J. "Bill" Age 90 of Minnetonka, formerly of Mpls, Golden Valley, and Glencoe, died June 6. Treasured dad, grandfather, uncle, hunting buddy, and bridge player. 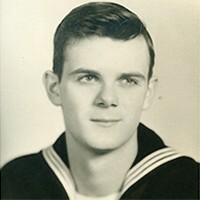 Navy veteran, graduate of Univ. of St Thomas, insurance salesman, stockbroker, and owner of Greenhead Hunting Club near Elk River. Preceded in death by son William, ex-wife Barbara, and grandchildren Zachary and Mary. Survived by children Mary Ann (Charley), Kevin (Nellie), Caroline (Henry), Tim; and grandchildren Hope, Valerie, William, and Mercy. Funeral Mass on Wed. June 27 at 11:00 am, visitation one hour prior, St. Mary's of the Lake Catholic Church, 105 Forestview Lane N, Plymouth, 763-545-1443. Published on June 17, 2018 "
"Bill was around at the at the time of Blackmoor, and also played in many of the other games we were playing at the time. 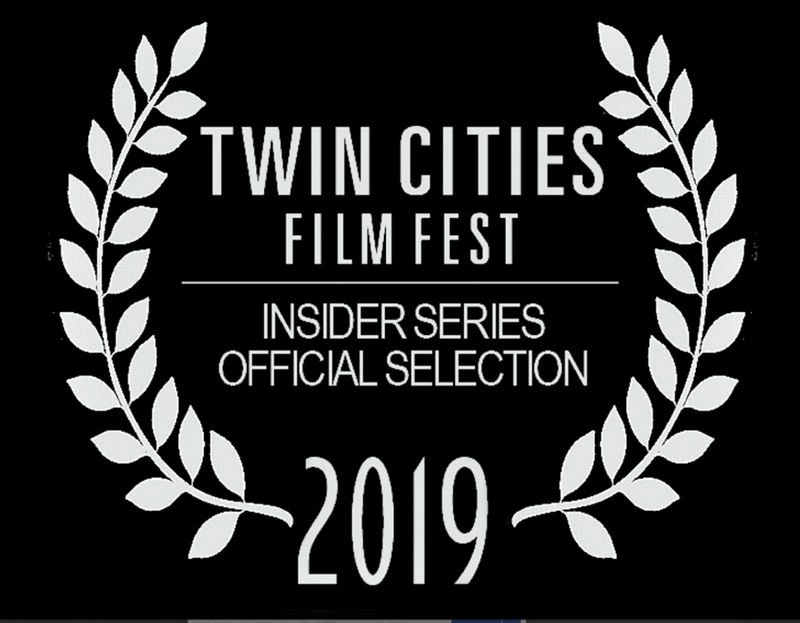 He was consumed in working on an invention that he was trying to perfect, and ended up moving in with relatives in a western suburb of the Twin Cities. We did not see much of him after that. I lost touch with him long ago. " Michael Mornard (Gronan) suggested to me that Crolley may have been present when Dave Arneson had first introduced Clerics into the Blackmoor Campaign. I don't like reporting on people having passed away, because it feels so selfish thinking about the things I would have liked to ask of William Crolley and others. At the same time, I think this blog needs to make a record of everyone who in some way added to Blackmoor. Thanks to Aldarron for pointing me to the most recent information about William Crolley in a discussion at the Comeback Inn. If anyone knows more about William Crolley, his involvement with the Twin City Gamers or has other relevant information, please share in the comments or contact me directly. More discussion of this article here. On this day, it is 10 years since Dave Arneson passed away. The Co-Creator of D&D is not forgotten. The Blackmoor Fandom, centered around the Comeback Inn and our associated sites are still going strong. We are still releasing the MMRPG modules which are approaching the end of their run soon. In addition, we are continuing the PDF booklets by Greg Svenson. Much more will be happening this year too, so stay tuned for that. 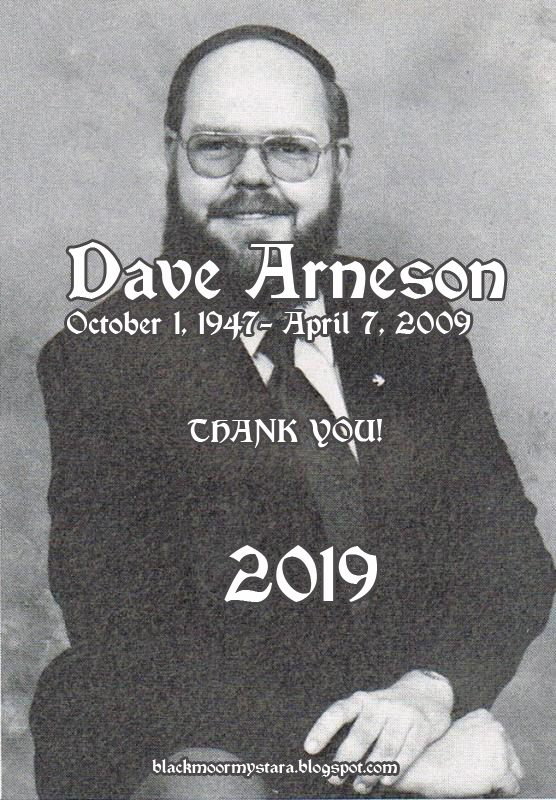 Dave Arneson Day last year was a great success. Can we do even better this year? The Secrets of Blackmoor Documentary, although not associated with this blog, is coming out later this year. Already it has helped create more attention around Dave Arneson and the Twin City Gamers. 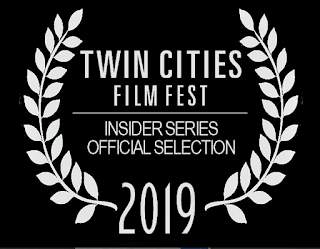 Speaking of the Twin City gamers, it is great to see so many of them coming out to talk about the early days of gaming. There are still so many great ideas there that are worth bringing back into modern day gaming. Many D&D fans will read about the unfortunate relationship between Dave and TSR, but this was just a small period in Dave's life. His life was too short, but he knew that he had created a legacy that would make millions happy. 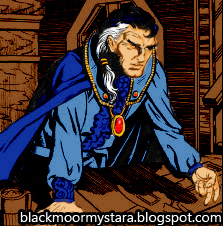 The last years of his life were spent bringing Blackmoor back and getting the recognition that he deserved. And we fans remember well, 10 years later. "My dad had this ability to connect with the people around him. And had this creative archive in his imagination paired with the skill of story telling. Resulting is this concept of Dungeon Master. And that he was The Master. If you live in the region and have a chance to drop by the festival, please send photos and info this way! I would love to see first hand reactions to this premier! The Bone Pit - New Free Fan Adventure for Blackmoor! Jon Goméz known to some of us as Zeromaru X has written his first Blackmoor adventure. This free fan written adventure explores the Yellow Mists that overtook Bozero's lands (controlled by Jon Snider) as described in the First Fantasy Campaign. The adventure uses the Advanced Fighting Fantasy Rules, but is easily converted to other rulesets and editions. Download this Blackmoor adventure for free here! Would you like to see more adventures by Jon? Let me know and I will pass on the word! PS: What was that weird post yesterday all about? Come on, it was April 1st! Read an updated version of that article to understand more of the background for that one. April Fool's: Skyship Admiral Takes Game Desiger Hostage! April Fools: BREAKING NEWS: Famous Admiral Appears in Washington, Takes Game Designer Hostage RENTON, Washington — A naval officer who was declared dead when his legendary vessel crashed exactly seven years ago today made a sudden and unexpected reappearance in Renton, WA. Witnesses reported a series of strange flashing lights culminating in a group of people in strange clothing appearing in the middle of a car park. From there, the situation escalated quickly. The interloper’s leader announced that he was “an admiral of Her Imperial Fleet”, and began to accuse Mr. Mearls of collaborating in the destruction and looting of his “sky-ship”. “It was your company’s employee, a Mr. Robert J. Schwalb, who reported that my ship was crashed — my crew dead! — was it not? !” When Mr. Mearls informed him that Mr. Schalb no longer worked for the company, and was not there, the group became agitated. A large-looking man wearing a tiger-like mask (which looked amazingly real) stepped forward and grabbed poor Mr. Mearls, and amid shouts of “The Princess will have vengeance!” the whole group disappeared in a cloud of coloured smoke. The current whereabouts of these people and the unfortunate Mr. Mearls is unknown. Police have interviewed witnesses, but many find the whole situation to be inherently unbelievable. In other news, scientists today discovered hitherto unknown tunnels leading deep into the interior of the Earth. "We never would have believed these tunnels could go this deep!" the lead scientist told reporters. "Ordinarily the conditions beneath the ground would make such deep tunnels impossible. And yet, here they are." For the record, the text linked above was written by my good friend Thorf. Were were discussing the idea of an April Fool's Joke that was a little retort to the pretty poor taste joke WotC played on Mystara's expense back in 2012 which is linked in the article. Thorf suggested I post the text on my blog. Failsquad Games recently announced a new Kickstarter featurng a reimagined version of the legendary 1983 Red Box intro adventure featuring Bargle and Aleena. 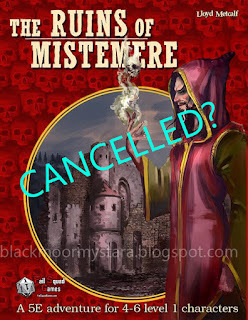 Labelled The Ruins of Mistemere (after the Red Box's Castle Mistamere), the adventure promised in the Kickstarter also included several of the characters from the dungeon with their names slightly altered. 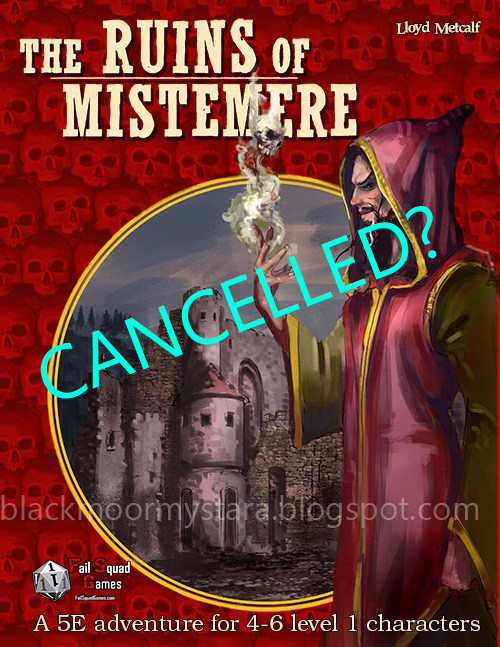 The Ruins of Mistemere - a 5E adventure is the subject of an intellectual property dispute and is currently unavailable. If you are interested in this project, please check back later. Thanks for your patience. 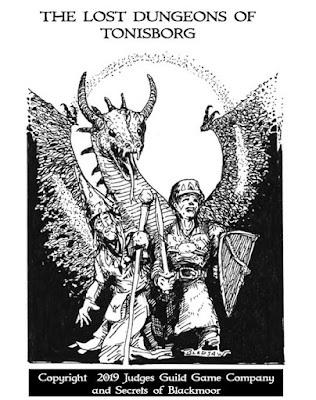 Description of copyrighted material: "The Ruins of Mistamere" was an adventure found in the classic Advanced Dungeons & Dragons Red Box - a starter set for D&D created in 1983. Description of infringing material: This Kickstarter plans on recreating an "inspired by" version of our copyrighted material. It is derivative and not authorized. As you can see from their own description, anyone familiar with the original material would know what they are trying. Castle Mistamere is an iconic dungeon and Frank Mentzer's tragic story about Aleena the Cleric and the evil Wizard Bargle have inspired generations of gamers. The characters made it into the Mystara setting with Gaz1 Grand Duchy of Karameikos and have been revisited since in the Kill Bargle adventure in Dungeon #150. It would be really nice to see this adventure reimagined for the current edition of Dungeons & Dragons. That said, Wizards of the Coast's objection in this case does not strike me as unreasonable. 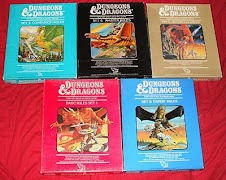 (Even if they called it the Advanced Dungeons & Dragons Red Box... ;) ). Lloyd Metcalf of Failsquad Games told me he understands WotC's position. He felt "they were in fair use territory", but stresses that FSG does not want to infringe on anyone's IP. It looks like that is the end for this product. The company is moving on to work on an Old School fanzine called "Maximum HP"
Lets hope Failsquad Games finds success with less problematic projects in the future!